Avast! Antivirus is the most trusted and popular antivirus in the world and a leader among worldwide antivirus vendors. “With nearly 200 million customers in 43 languages — a staggering 1 million users in 38 different countries — it is used by more people than rivals AVG Technologies, Symantec and McAfee combined,” wrote Jon Swartz in a recent USA Today article. 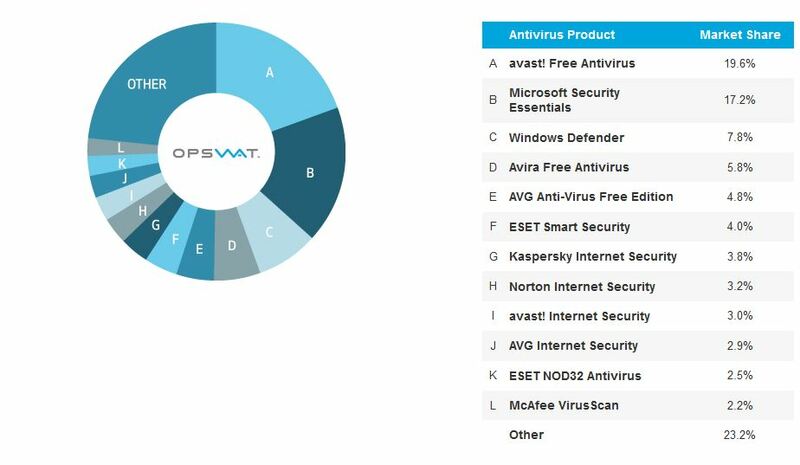 Data from the October report by OPSWAT shows that AVAST leads overall in worldwide product market share for antivirus and encryption applications. Microsoft Security Essentials is the only other vendor that comes close. "Avast has held its own in the hotly contested consumer-security market - it ranks in the top five, based on market share, in North America, Latin America, Europe and Asia Pacific - because of a fiercely loyal user community,” said Heidi Shey, security analyst at Forrester Research. “Fans, especially for a consumer product, go a long way. Avast users have even volunteered to help translate their product into different languages as a result." Microsoft admitted earlier this month that “Windows users should install antivirus above and beyond its own Security Essentials,” describing its protection as merely a "baseline" that will "always be on the bottom" of antivirus software rankings. Lifehacker comments on Microsoft’s announcement saying, Microsoft's new approach means you're best off using a third-party tool in your arsenal, like our current favorite, Avast. Please share this Facebook post with your friends, so they can make the switch to the most popular (and trusted) antivirus in the world! Thank you for using avast! Antivirus and recommending us to your friends and family. For all the latest news, fun and contest information, please follow us on Facebook, Twitter and Google+. Business owners - check out our business products.